Please consider volunteering to serve as a Committee chair or assist on a committee. Contact any of the above people if you are willing to help. We had a great turn out for the January meeting. Ray and Betty Laughlin provided chili and several members brought an assortment of desserts. Thank you to everyone that contributed to the meal. Our club just completed yet another successful tracking test. We had 2 TD and 5 TDX tracks available resulting in 1 TD & 1 TDX dog team celebrating their new titles after completion of their tracks. We thank our judges Ken Barna and Jeanne Ramirez who also donated her judges fee to the club. Jan Winner, Nancy Parson-Wright, Karen Shawhan & Rosi v.Fintel. Special mention to Ray and Betty who donated a wonderful lunch for the judges and helpers on Saturday. For Ray it was the 1st time that he plotted a TDX track and for Megan and Aaron TDX cross-tracks respectively. Great for the sport to attract members who have never done anything like this before and by all accounts, they all had a good time. It was brutally cold with a biting, strong wind and snow flurries. We only had two qualifiers and neither was a club member. Our Darcy Seeger was entered for a TDX and the team did really well until the dog went for the cross track and was whistled off. Hopefully they will pass next time. 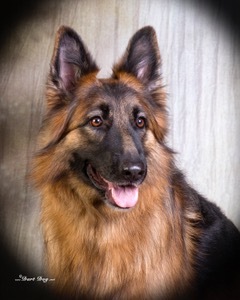 The TDX qualifier was Belgian Tervuren Ch. BlackFyre Tarragon Optical Illusion TDX HT, call name Lexy, owned and trained by Sharon Redmer. Lexy is 2 years old and is Sharon's 2nd TDX and her 4th TD. Sharon is her breeder and also owns Lexy's father, who was first alternate in Sunday's test. The TD pass was Sheltie Postscript Ewe Herd Me Right, BN, RI, PCD, HSAs, STDs, TD, CGC - call name Lola, owned and trained by Sandy Burns. Lola just turned 2 years old, and is Sandy's second TD dog. Sandy says Lola LOVES tracking, herding, obedience and loves to work! Lola’s father and grandmother both have TD’s, and breeder Pat Sorrels is working on getting her dam's TD as well. Neida Heusinkvelt was the tracklayer for the TD pass *and* was a cross-tracklayer along with Aaron Stasiale the passing TDX track. Tracklayer for the passing TDX was Rosi Von Fintel. 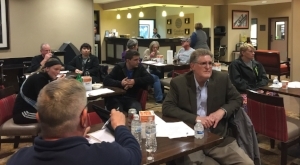 Tuesday, February 13, 2018, General Meeting, 7:00 p.m., Comfort Inn, 7300 NE Parvin Road, Kansas City, Mo. 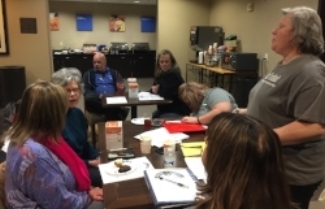 The Board will meet at 5:30 p.m. All members are welcome to attend the board meeting. Training opportunities will once again be offered this year. The following dates have been established. Details will follow as the classes and instructors are firmed up. TEMPERAMENT TEST COMING NEAR YOU! The German Shepherd Dog Club of Greater Kansas City is offering the Temperament Test on Saturday, June 9, 2018. You have three months to get your dog ready. Let’s have a good turn out for this important event. Neutral Stranger: This test is to simulate a typical street situation. The stranger will carry on a conversation with you, but will not make overtures to the dog. The GSDCGKC is pleased to welcome Darcy Seeger as a new member of the Club. Darcy is no stranger to the breed. She brings to the club her expertise and vast knowledge. We are honored to have her join us. Take time to introduce yourself to Darcy and welcome her to the club. After a long recess, I am happy to offer tracking classes at the Smithville Lake area beginning this spring. Classes are either private or semi/private and scheduled around your availability weekly or biweekly, depending on your progress. The cost is $120.00 and will cover all classes required until passing the Certification Test. A 10% discount is offered to club members. Our hearts are saddened at the loss of our beautiful girl, Ali. She came to us as an “owner surrendered” rescue when she was 18 months. Her previous owners had told the rescue that she was “uncontrollable” and I knew right away that she was going to be ours. Upon meeting our older rescue male GSD, Max, she tried to bite his face…so we had a conversation right there and then that we don’t act like that in our house. She never tried it again and they remained the best buddies from that day. Ali always pushed me to be a better trainer; she challenged me and questioned me every day. Her work ethic was incredible, she loved to figure out the “game” and wanted more. Her favorite game was tracking. She knew it was a tracking day when we loaded the car and she would “sing” all the way to the park. Her TDX test track was on a snowy, cold February day at Smithville Lake. There was new snow on the ground that morning…a tracking dream! Ali took off like a shot at the start and ran down the first leg and hit the first corner pulling hard…I was thrilled as she was right in the footsteps of the track layer. All of a sudden, she pulled a hard right-turn and ran 20 yards into fresh untouched snow; she stuck her nose in the snow and came up with a blue sock! Someone from who knows when had lost an article but Ali was able to find it and she came running back to me flipping it in the air with joy! The judges were as surprised as me, but I knew that we had more track to get through and other articles to find! She finished her track that day with a pass! Her friends were friends for life, she never allowed anyone to spend the night at our house until she had checked to make sure all were tucked in where they were supposed to be. She took her job of babysitter to our grandchildren very seriously and would entertain them for hours retrieving toys for them. Ali chose her dog friends very carefully too, she loved showing with Sally Hamm’s Kona in Open and Utility Classes. As we pursued the PHD of dog obedience, the Utility Dog Excellent title, we spent hours with our friends Lisa and her gorgeous Rotweiller, CH Lorenz, as well as Rosi with her whip smart GSD, Maya. All great dogs and all at the Rainbow Bridge now. It’s never easy to let a loved one go, but her time here was becoming too painful and so we had to make the last loving decision for her. Run free my sweet, naughty girl…until I see you on the bridge. On February 12th and 13th, top dogs from around the world will venture to New York City to compete for the coveted title of Best in Show. Breed judging, Junior Showmanship Preliminaries and Masters Obedience Championship (Hound, Toy, Non-Sporting and Herding Breeds). -Live Stream 10 rings for FREE on WKC website and FOX Sports GO. No TV provider login needed. Dog Show Group competitions (Hound, Toy, Non-Sporting and Herding Breeds). LIVE on FS1. -Live Stream on FOX Sports GO with TV provider login. Breed judging and Junior Showmanship Preliminaries(Sporting, Working and Terrier Breeds). Selected live coverage of Breed judging (Sporting, Working and Terrier Breeds) and Junior Showmanship Preliminaries. Dog Show Group competitions (Sporting, Working and Terrier Breeds). Best in Show. LIVE on FS1.